Micromem Launches Product – Micromem Technologies Inc.
Toronto, Ontario and New York, New York–(Newsfile Corp. – June 26, 2017) – Micromem Technologies Inc. (CSE: MRM) (OTCQB: MMTIF) (“Micromem”) (“the Company”) through its wholly owned subsidiary Micromem Applied Sensor Technologies Inc. (MAST), announces it has released for routine sale the RT-Lube Analyzer, the first in the world instrument platform that is capable of real time, on site detection of wear elements in lubricating fluids. The Company’s initial focus is early indication of problems occurring on wind turbine gear boxes that lead to unscheduled and expensive downtime, an installation for this application has already begun. This technology however is not limited to the wind industry, initial uses in any environment where the measurement of lubricant wear materials in real time is advantageous such as dangerous build ups in power transformer insulating fluids or carryover of chemical constituents on product surfaces. With modifications applications in organic fluids are also possible such as real time measurement of impurities in wines and other spirits, noninvasive glucose detection in potatoes and other fruits. These are just a few of the examples of where real time measurement and detection is applicable. Currently the process to test lubricants is to take a manual sample for lab testing. This approach is expensive, labor intensive and time consuming. The RT-Lube Analyzer can replace this manual approach by automatically sampling, on a pre-scheduled basis, the fluid under consideration. The analysis is immediate and is communicated back to cloud based storage systems where the analytics can take place. The method of communication is flexible and information can be made available to anyone from any location in the world. The value proposition of this device is to provide prognosis of pending failure modes prior to the actual failure happening. In the wind turbine area, particle analyzers and vibration sensors are effective at alerting failures as they occur. The RT-Lube Analyzer measures multiple wear elements in lubricants and predicts that a failure is pending soon enough to allow operators to island the turbine and schedule the repairs. 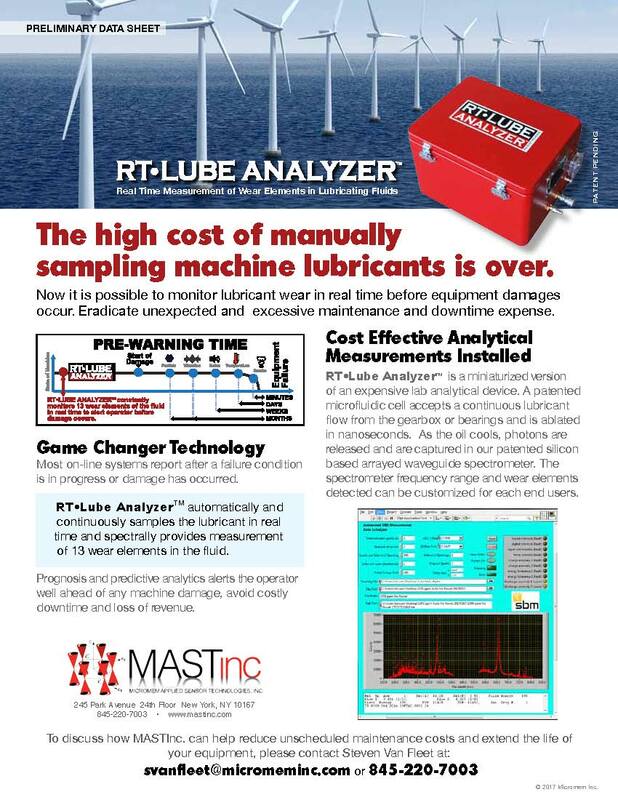 Cost effective, the RT-Lube Analyzer is a game changer in the various targeted markets MAST is pursuing, opening the Internet of Things to industries that need to adapt and become more cost effective in the information age. 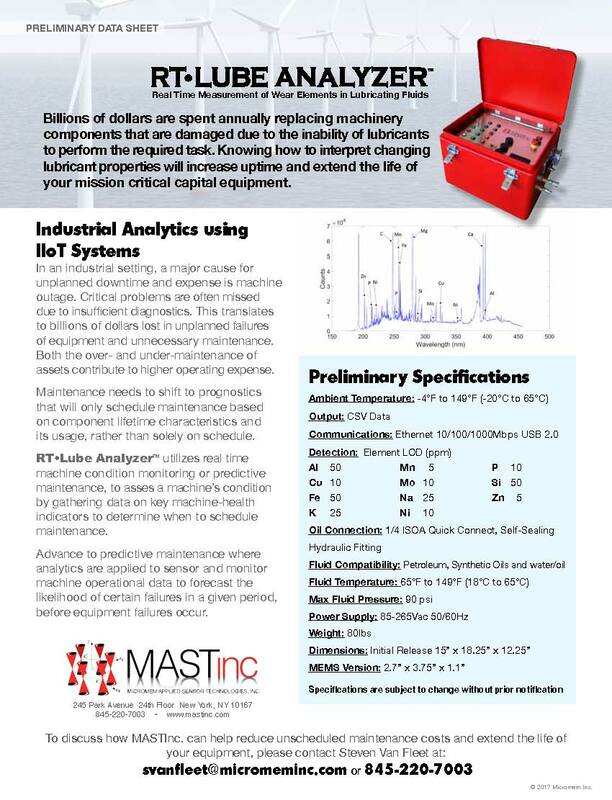 RT-Lube Analyzer Data Sheet (attachment).